Last year, Coach released a special Mickey collection that sold out INSTANTLY. I went to a Coach store around 1pm the day it released and the store was literally down to it’s last few items for each style. So this year, Coach released another Mickey collaboration only in their outlet stores. The assortment was reminiscent of the original collection, but included a lot more styles and variety. You best believe I snatched up a bunch of the bags and maybe a jacket…or two. Well, one of the jackets was gifted to me, so that doesn’t count. But regardless, this was probably my favorite collaboration of the year. I wear those Coach x Disney bags so often and the jackets I’ll keep forever! Another collection I loved was the UNIQLO x Olympia Le-Tan “Minnie Mouse Loves Dots” collection. I’m usually more of a Mickey lover, but the Minnie graphics were too cute to pass up. I especially loved the embroidered details that tied all of the pieces together. I’ll admit, some of the shirts were too sweet for my taste, but I fell in love with the cropped tattoo-esque shirts with Minnie’s face and banners flanking each side of the collar. I loved it so much, I picked up both the black and red colorways. I also picked up a couple of the bags, but my favorite is probably the red structured Minnie bag. Cakeworthy released it’s first official licensed Disney collection earlier this fall and it is amazing. Cakeworthy always delivers the coolest Disney streetwear clothes around. Compared to many other small apparel businesses that create Disney-inspired clothes, Cakeworthy items always have that unique punk edge. I immediately loved the Neverland denim embroidered jacket and the novelty Mickey pizza bag. Both are a little out there, but super special pieces that can’t be found anywhere else. I’ve known the brains behind Cakeworthy for a few years now and they are amazing people. They always find that one thing that Disney fans want but doesn’t actually exist, and then make it into a reality. Their ability to identify the white space within the Disney apparel world is what puts them ahead of the rest. 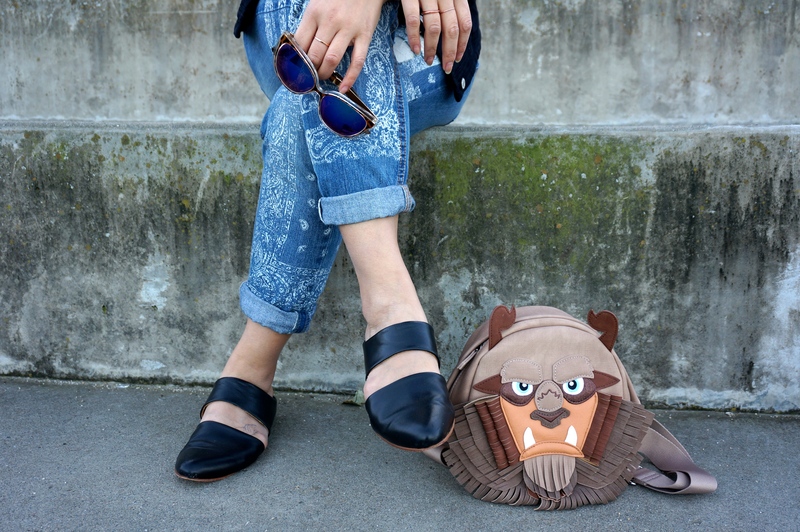 Photo from Cakeworthy’s Disney Lookbook! I know this one isn’t necessarily clothing, but I had to add it in after my boyfriend so thoughtfully gifted me the Pendleton Mickey wool blanket for Christmas! After seeing it as part of a Disney Style gift guide, I immediate knew I had to have it. They also released a few kids’ throws which are adorable for families with younger children. But for the adult that’s young at heart, the Mickey’s Salute throw is perfection. It’s the ideal mix of Pendleton’s classic geo patterns and old school Disney charm. And I am a total sucker for that timeless Mickey. If I ever end up not using it (stab me if that ever does happen though because that would be a heinous crime committed against this blanket), I love the idea of framing it and making it this huge piece of artwork to hang on the wall! So those are my top five favorite Disney collaborations from this year! There definitely was a huge number of Disney collections, but these were the few that I really coveted. And the fact that I had to narrow down my choices is exciting! Compared to 2016, I felt 2017 was the year many designers and companies finally realized that people love Disney and Disney products! Within the past few years, I think more people are finally comfortable showing their love for Disney in everyday life – namely in apparel!